Used for washing cell cultures and as diluting factor by tittering suspended viral matter and diagnostic serums as well as in physiological reactions, and for washing testing equipment. Sterilised through filtration. 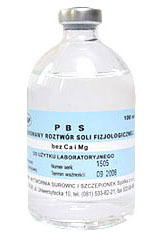 Control tests of Ham’s F-10 nutritient mixture include sterility, pH (7.4 ± 0.2), osmolarity (270-300 mOsmol/l). On customer’s demand, the PBS fluid without calcium and magnesium can be prepared.